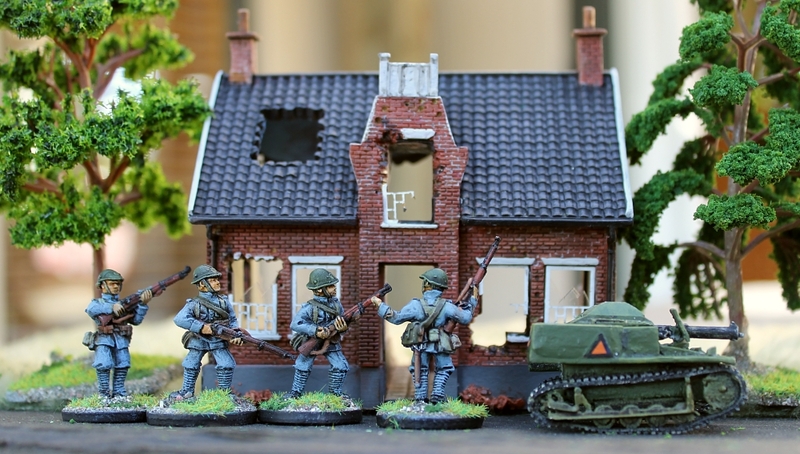 DRESSING THE LINES – Thoughts about wargaming, especially 28mm. An army marches on its stomach, so they say. Thus no army is complete without its supply train. In the final installment of this inspection parade of my French army, let’s look at the supply train consisting of these four carts. And we’ll finish with some eighteenth century civilians. 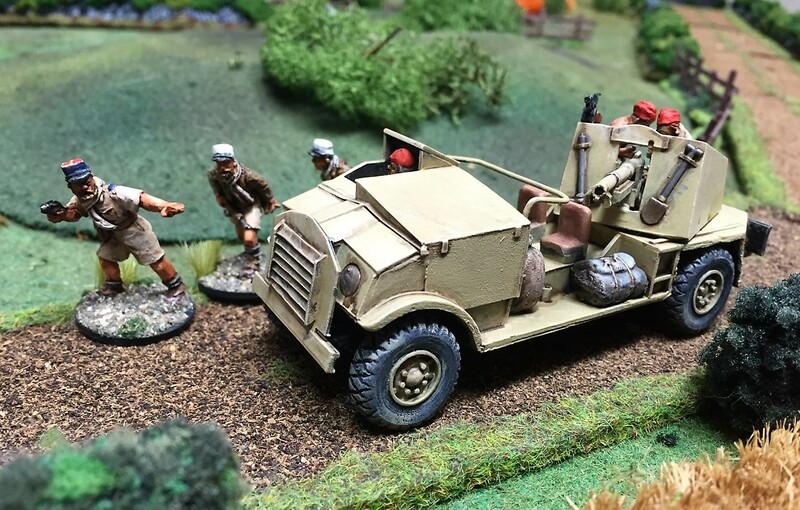 On the left is a four-wheeled ammunition wagon. Front Rank offer this with two different types of top – the rounded wicker lid as shown above, or the wooden one in the picture below. On the right is a smaller ammunition cart drawn by one horse. It also has a wicker lid. The soldier walking alongside is in his red waistcoat, having removed his white coat. 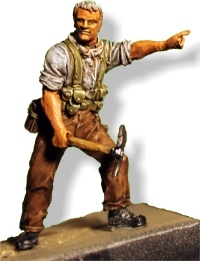 He is actually a French and Indian Wars miniature, with a hatchet in his belt. The supply wagon shown on the left is advertised in the Front Rank catalogue as a medieval cart. But I thought it would be totally suitable for the eighteenth century. I’ve added some sacks as cargo. The civilian driver is also by Front Rank, but I understand is quite an early product in their range – thus the rather large Thunderbirds-style head! On the right is the same four-wheeled ammunition cart we saw in the previous picture, but this time with the wooden top. I was particularly pleased with the way the oil-painted horses came out. 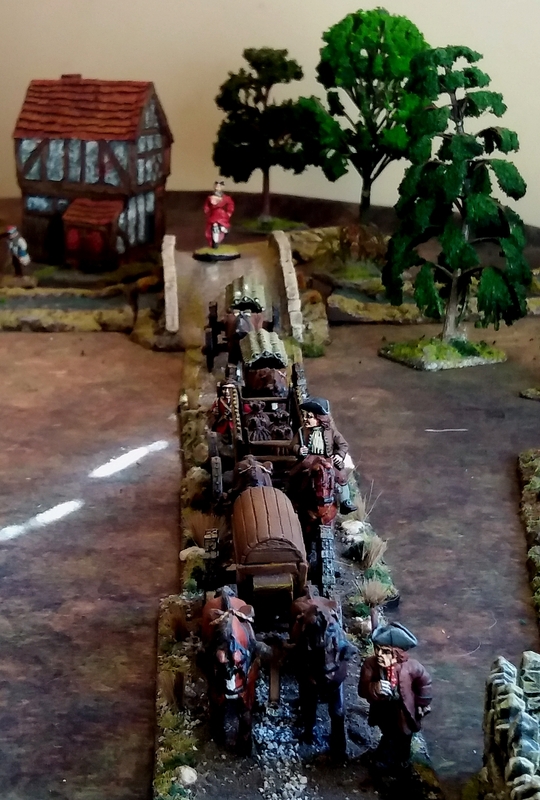 For the French army, I have since learned that strictly speaking the supply train wagons should be painted red, rather than left in natural wood as I have done them. My biggest problem with these carts, especially those drawn by two horses, was making the traces for the horses to pull the wagons. Front Rank supplied some bendable wire for this purpose, but in the end I used embroidery cotton. You’ll note that I made the bases look like roads – grass verges, dirt tracks on either side of a shingle centre-line. This was all done with real sand and crushed shell, along with Games Workshop static grass. Battles during the eighteenth century were sometimes viewed by civilian spectators – though this could turn nasty if the side they were supporting lost the battle! 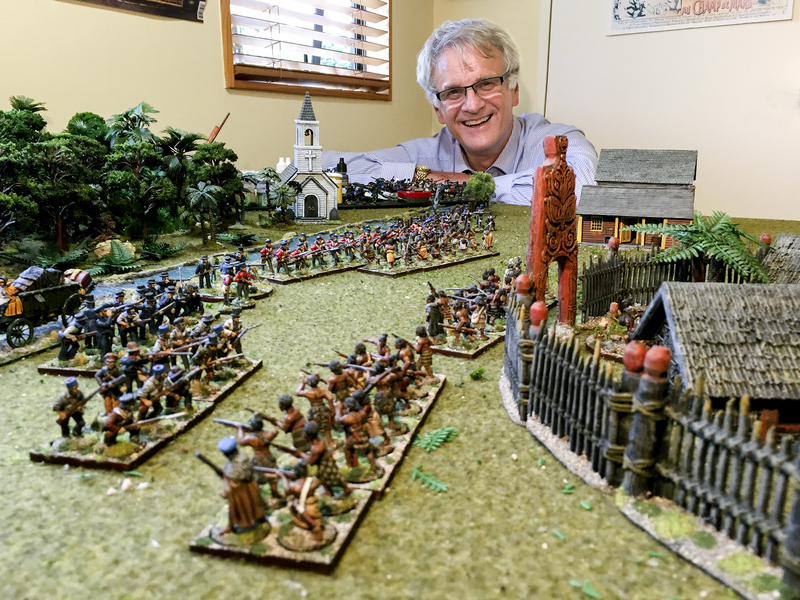 Back in 2006 I received a few figures from David Wilson, owner of Willie France, who was restoring the old 30mm Willie range. These were apparently the same figures that were used by Peter Young in his iconic book Charge! or How to Play Wargames. 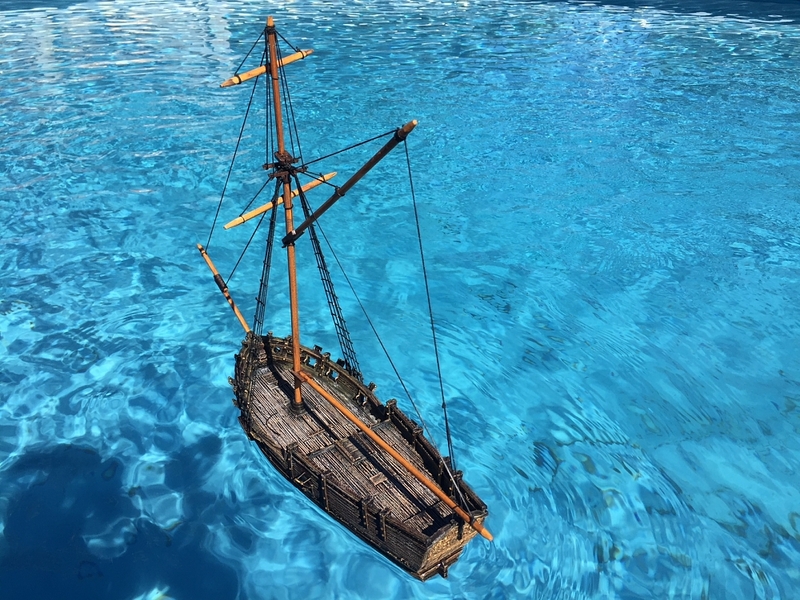 The original Willie sculptor, Edward Suren, started his production in 1964, specialising mainly in the eighteenth century, but covering ranges from the Romans to the Franco Prussian War. David told me that these classic figures were born of sculptor Suren’s enthusiasm for lifelike military figures full of dash and movement, whilst respecting anatomy. The samples I received were three women, and a number of officers. The officers were intended to hold separately-supplied weapons such as halberds or swords – but I thought they looked great empty-handed in the pose of ‘making a leg’ to the women. David’s reintroduced Willie range also had this rather homely running women in déshabillé. You’ll see her in the background of several of my photos, perhaps trying to catch up with an errant beau! 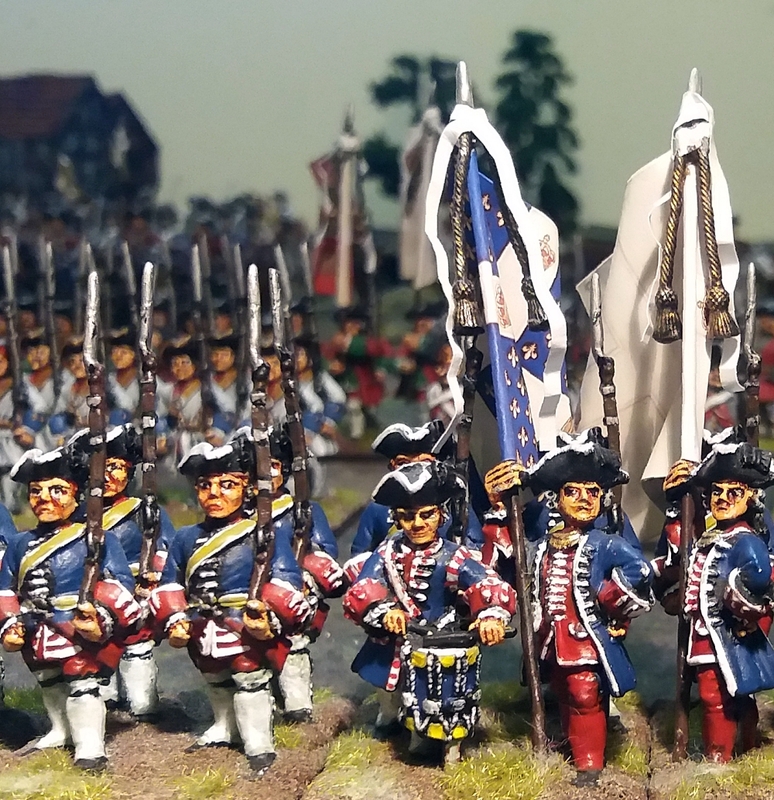 At the time David had a huge list of mainly 18th century 30mm figures that he planned to gradually add to the restored range. Some of the promised figures made very enticing reading: two hunt scenes, complete with hunting dogs and a stag or fox; various peasant women; in camp characters; the Irish Brigade charging; a highlander on a windy day (the mind boggles!) 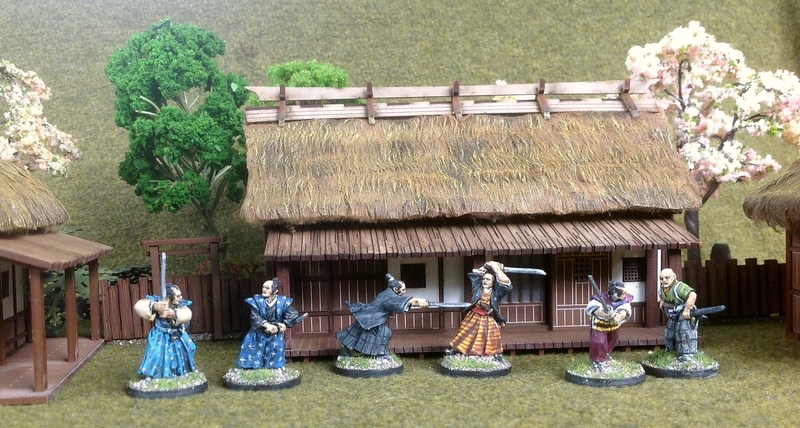 and many of the more standard poses for armies of the 18th century period. But unfortunately I can’t find what happened to David Wilson and his 2006 plans to reintroduce the Willie range. Perhaps one of my readers who knows can add a comment to this posting? I’ve also got this lovely miniature by Front Rank of an old soldier, still wearing part of his old uniform. That brings the inspection parades of my French army to a close. Next time in On Parade! we’ll move to a totally different army from my wargaming collection. I haven’t decided which period yet, but it could perhaps be samurai, pirates, WW2 French or Dutch, the Wild West … or something else. Who knows! 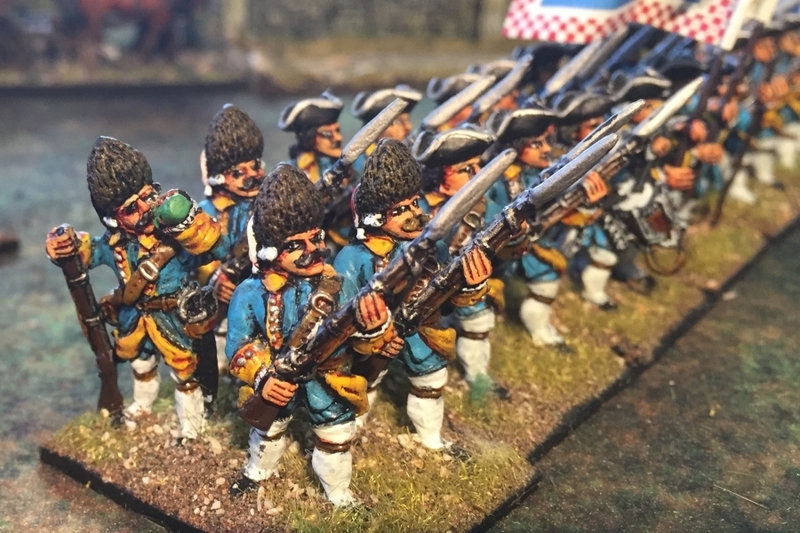 The guns in my French army, all made by Front Rank Figurines, are wonderfully detailed models that were a joy to paint. Jean-Florent de Vallière (Director-General of France’s artillery) reduced the pieces in use to a set number of types of cannon and mortars. He also recruited Jean Maritz, who had designed and built a water-powered horizontal cannon-boring machine in Geneva. By 1732 the first Maritz cannon boring machine was operational in the foundry at Lyon, boring out the Model 1732 system equipment. These standardised pieces became known as the “Vallière System”. The gunners are nicely detailed figures. 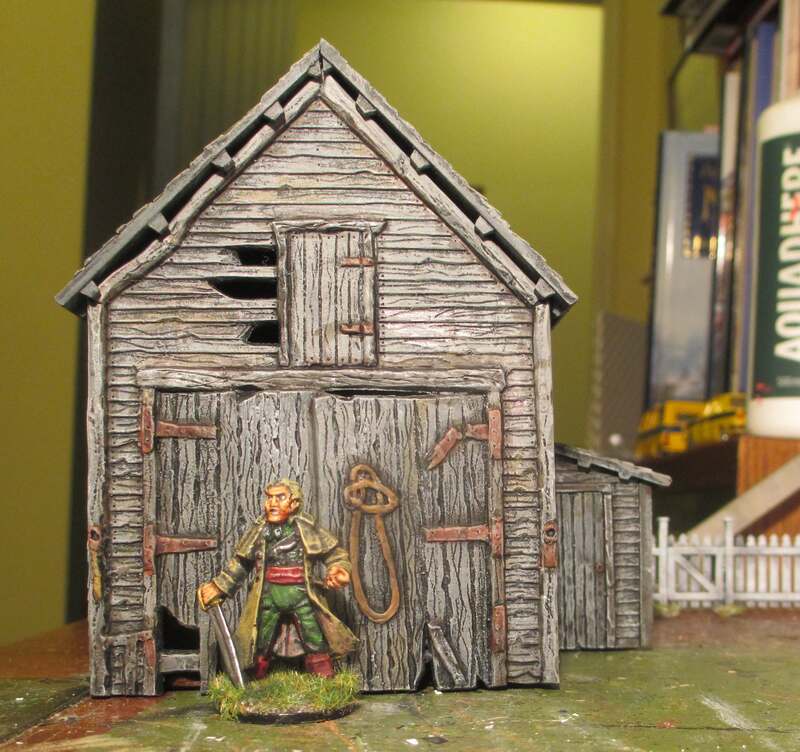 I could only fit three on each base, so I gave my other two gunners (an officer and a worker with a wheelbarrow) their own small vignette base. 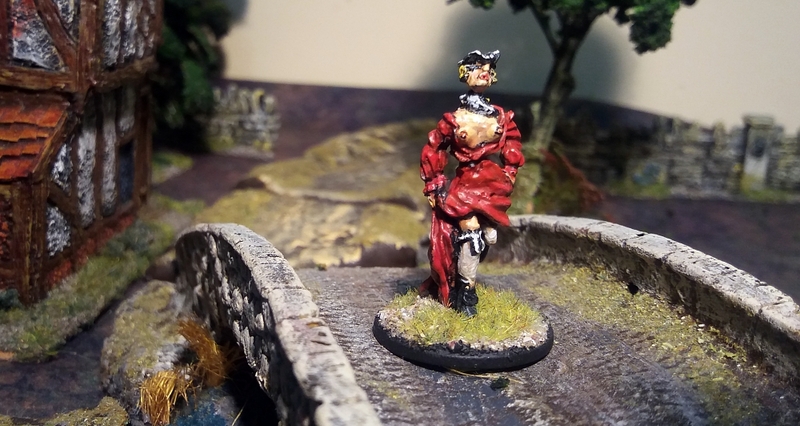 I also painted a light gun for service in the American War of Independence with the Volontaires Étrangers de la Marine (commonly known as ‘Lauzun’s Legion’). The Legion’s gunners apparently wore the same uniform as regular French artillery, but with yellow cuffs and lapels instead of red. 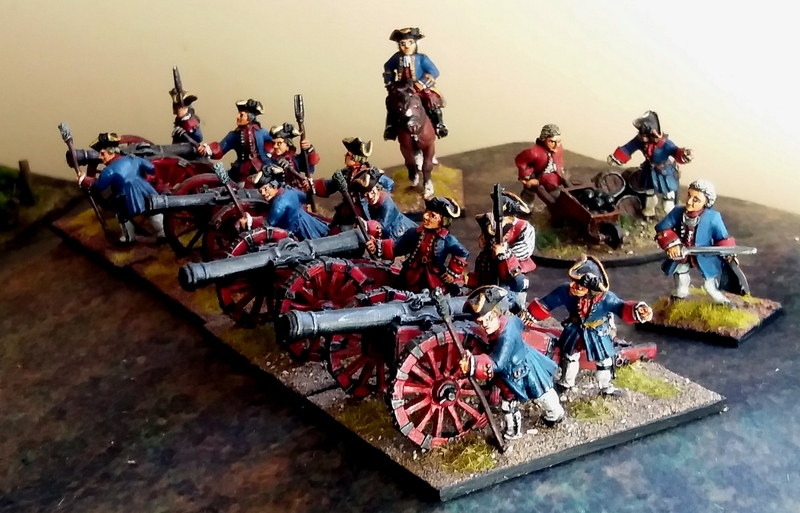 However, when my French AWI project went on hold, I repainted the cuffs and lapels red to fit them in with my other Royal Artillery figures. So that’s my French artillery. 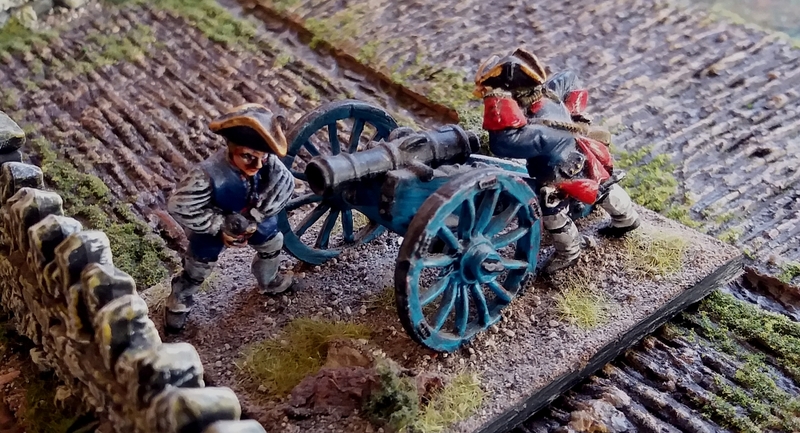 In the last of this series of inspections of my French army, we’ll review the supply train and some civilians. And don’t forget to visit my other On Parade! 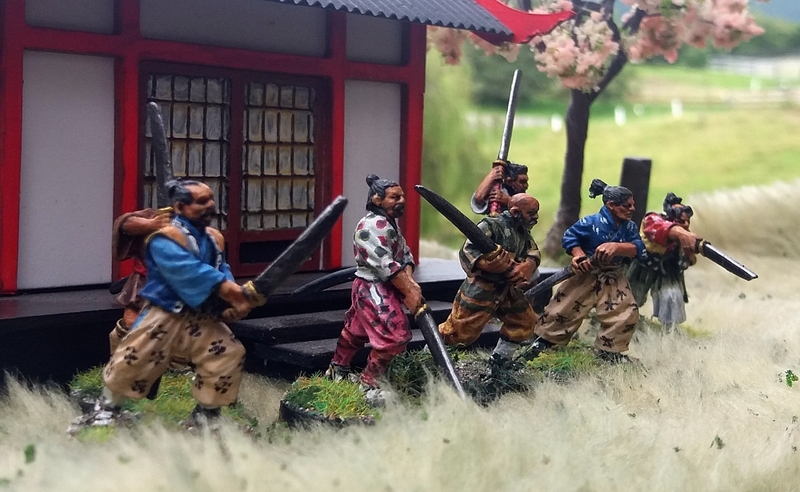 postings, in which I’m gradually doing inspection parades of every army in my wargaming collection. 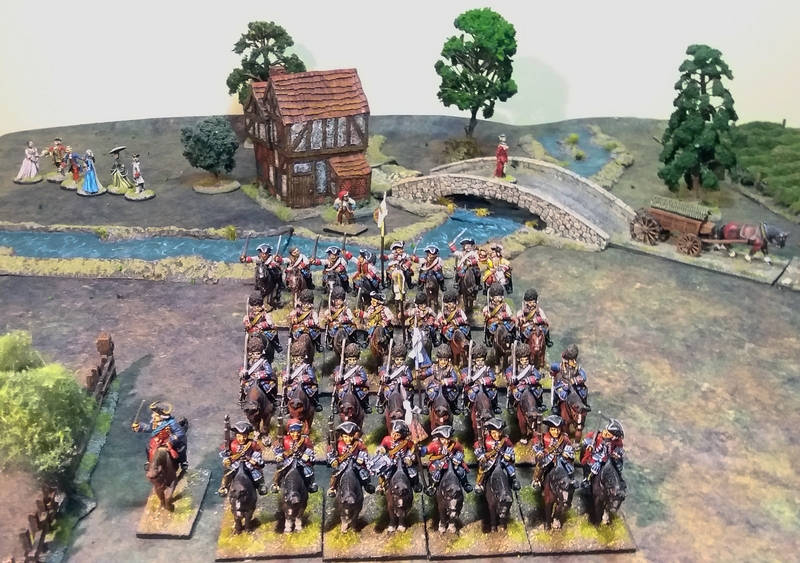 My inspection parade of all the armies in my wargaming collection continues with French cavalry of the mid-eighteenth century. They’re certainly colourful en masse! These were all painted in the very early 2000s, so represent my level of painting at the time. But despite the fairly crude shading and detail, they do look really good on the table, and have in fact stood the test of time quite well. As with most of my armies, the basing hasn’t been done to align to any particular rules. 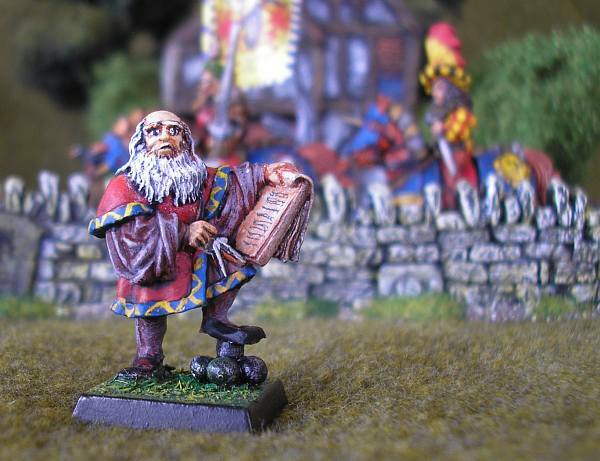 I work the other way round – I adapt rules to suit my basing! 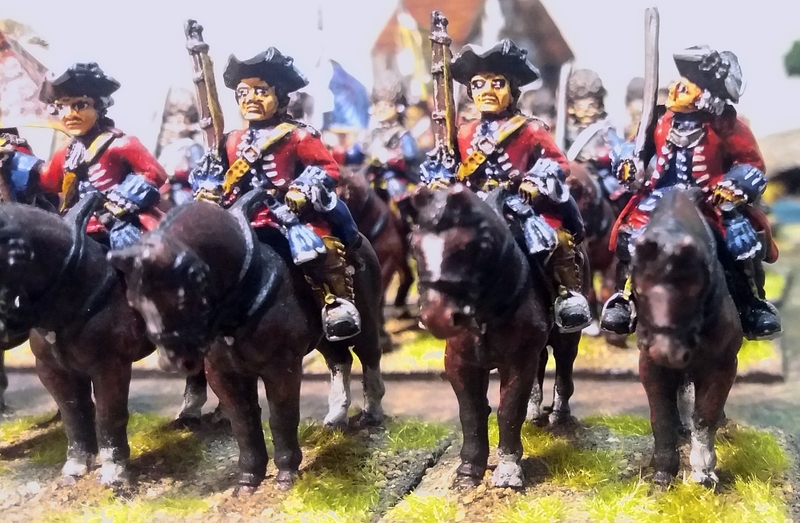 First up are the Colonel-General Dragoons. 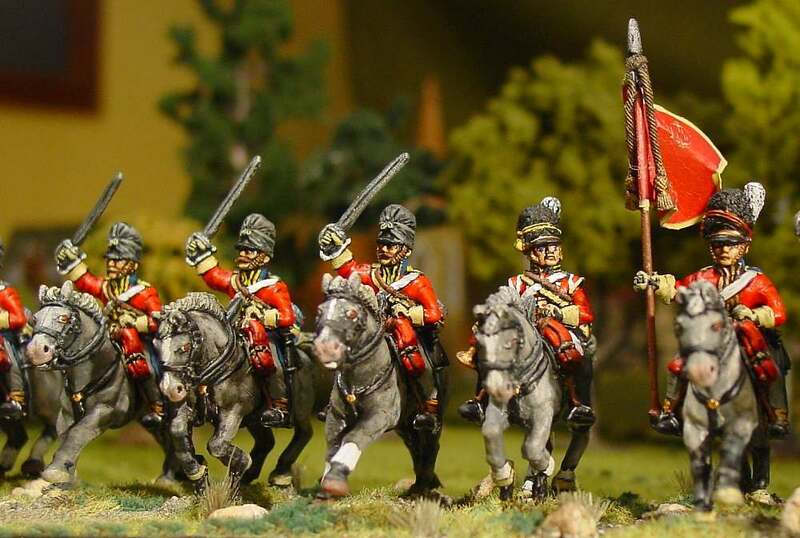 Dragoons were basically mounted infantry. 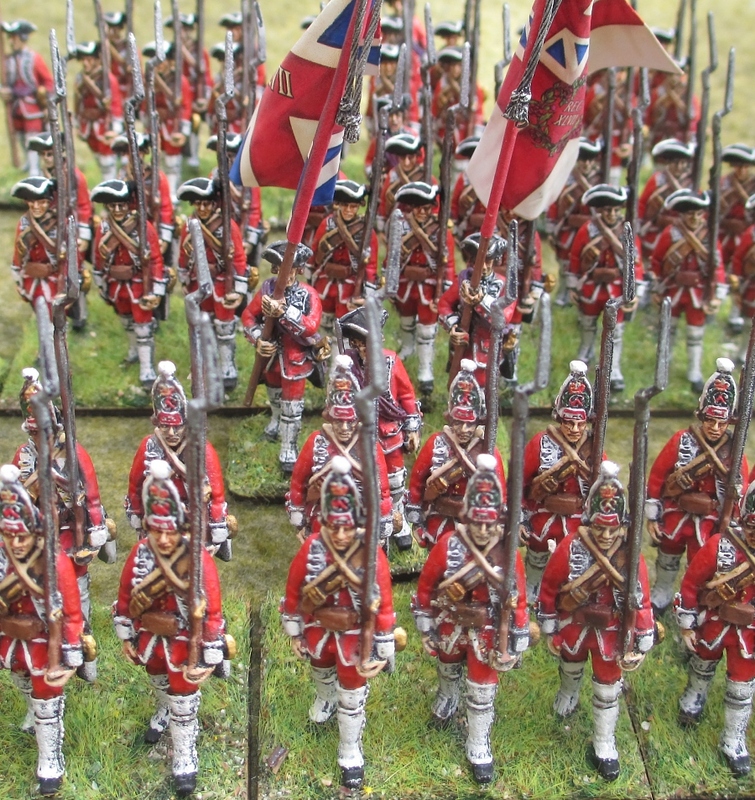 Thus these Front Rank figures, with their boot-gaiters (‘bottines’), short red coats and muskets really look the part. 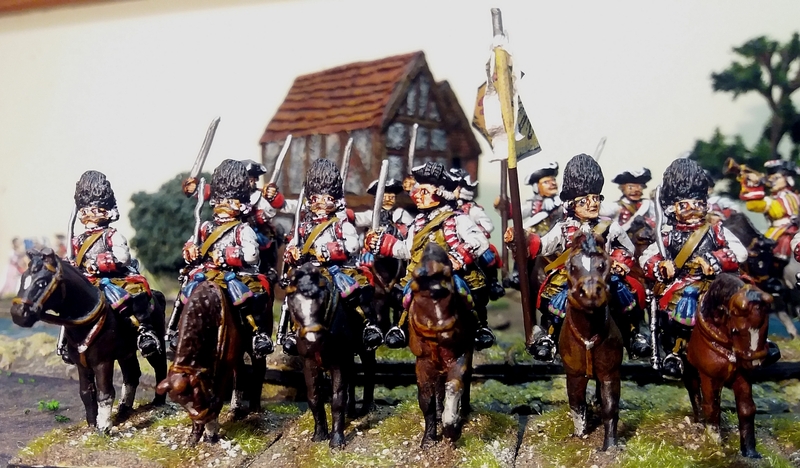 French dragoons were equipped with tools, such as axes, bill-hooks or saws, instead of off-side holsters, and these are faithfully represented on these models. I particularly like the way Front Rank have posed the officer on the far end, looking to the dressing of his line. The drummer is also a nicely detailed figure, carrying his infantry-style drum. 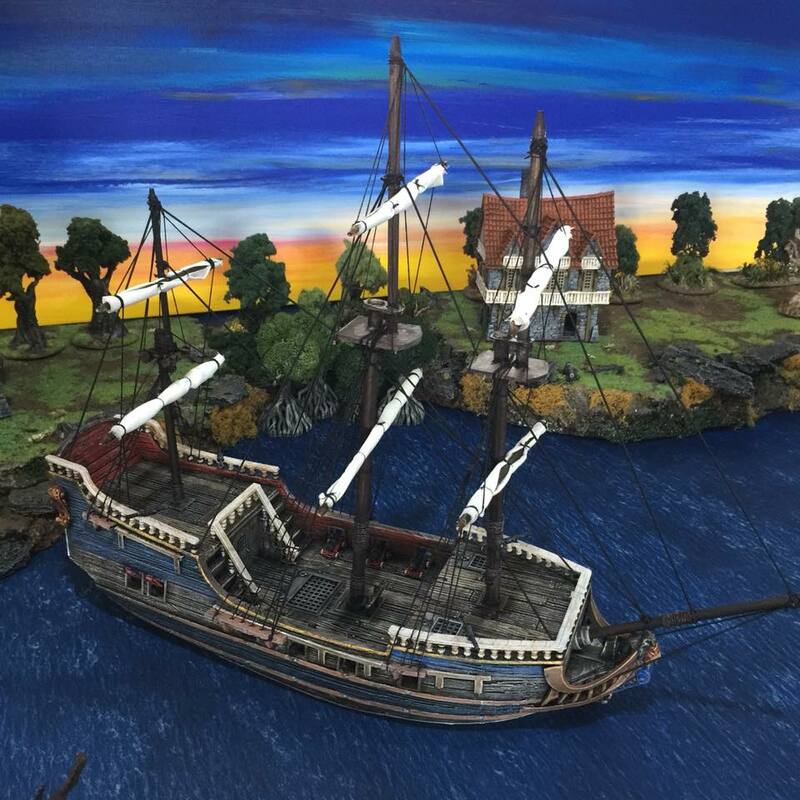 I used the Nec Pluribus Impar website for painting details, along with the Funcken uniform books. The flag was also from the Nec Pluribus Impar website, suitably reduced in my Corel Paint graphics programme, and printed out. The Cuirassiers du Roi, raised in 1653, were one of the few French cavalry regiments allowed to wear bearskin caps. They also wore armoured breast and back plates, lined inside with red cloth. 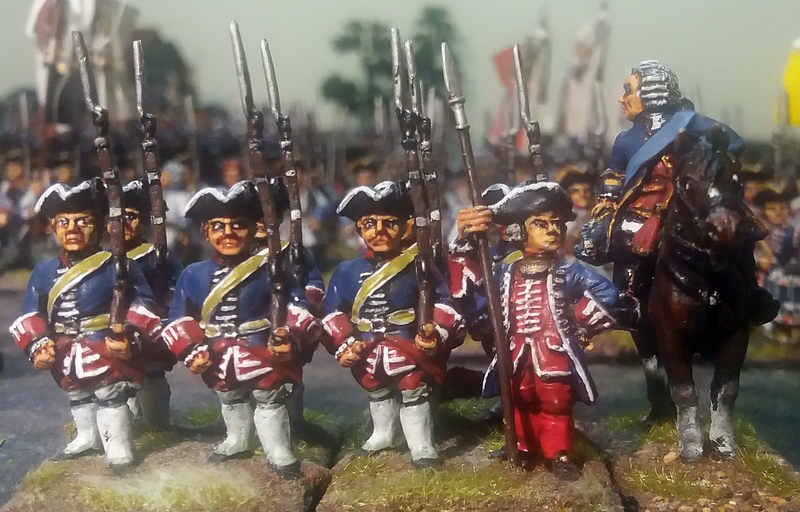 My source for painting these figures was the wonderful illustration in John Mollo’s Uniforms of the Seven Years War 1756-63. These Front Rank models were my first attempt at painting metal cavalry figures. I found it quite finicky to paint all that red cloth lining, piped in white, that sticks out around the cuirass. I used oil-paints for the horses, which went well – apart from one heart-stopping moment when I was applying the varnish and the oil-painted surface bubbled badly. Fortunately I was able to smooth it down, and it still looks OK eighteen years later! The flag is a scanned black-and-white illustration from a Pengel & Hurt publication, which I then coloured using my Corel Paint graphics programme. 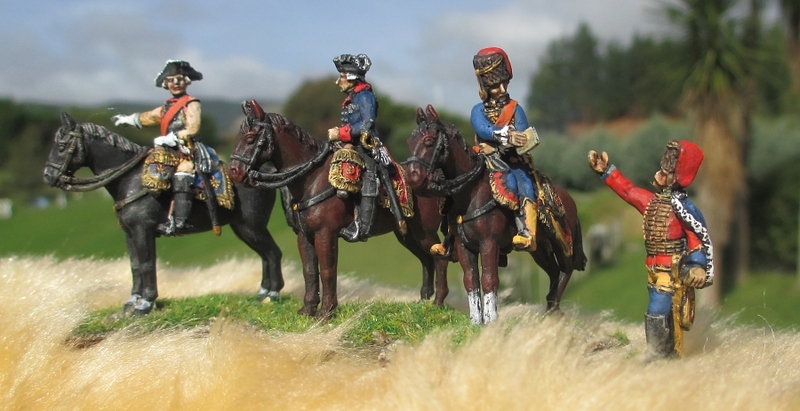 I got these fur-hatted cavalry figures wearing cuirasses in a bulk deal. 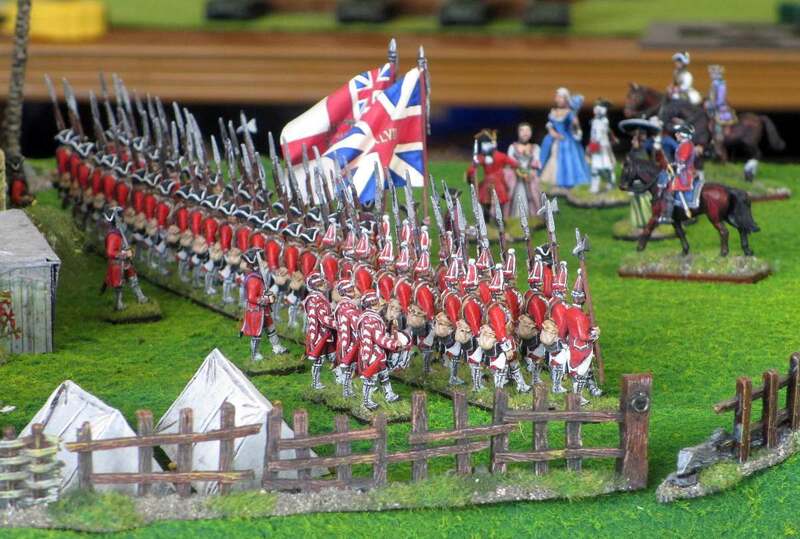 To ensure a variety of uniform colours in my army, I was determined that these figures would wear white coats. 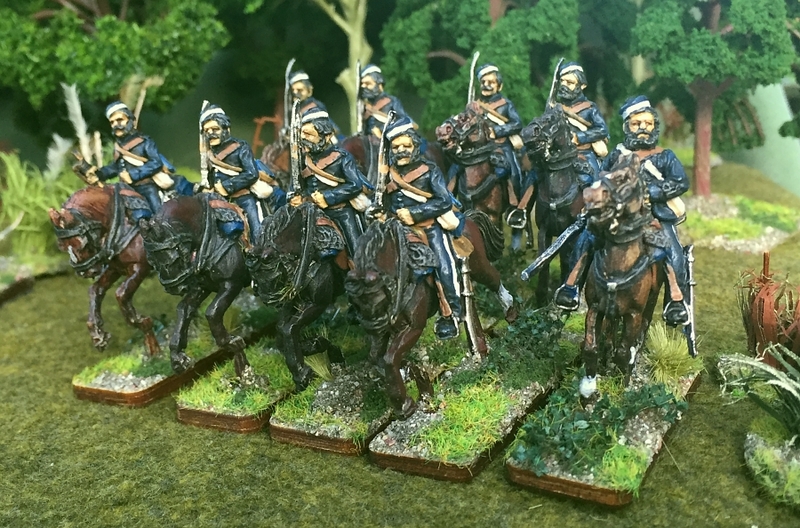 Out of the limited number of French units that wore white coats and fur hats, I decided on the Wurtemberg Cavalry Regiment, a German unit in French pay. The previously-mentioned Cuirassiers du Roi were the only French cavalry to wear the front and back plates that are depicted on these figures, but I already had a unit of them. Other cavalry, such as the Wurtemberg regiment, were only issued with front plates, but apparently seldom wore them. Therefore I painstakingly filed the back plates off each figure. The front plates were too difficult to remove, so I decided this was going to be one of those “seldom” occasions when their plates would be worn! Even this is not strictly correct, as the cuirass was worn under the coat, not on top. But this is the best I could do with the figures available. The flag posed another problem, as I could not find any pictures of the real flag. In the end I made up a design based on a written description in the publication by Pengel & Hurt. I even managed to add a white cravat made from toilet paper! These cavalry figures on galloping horses were amongst a bulk lot of Front Rank figures that I bought. 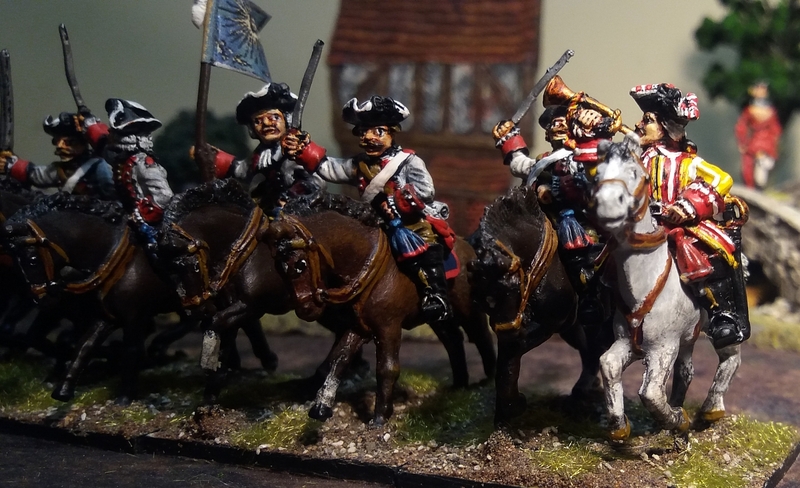 All my other mounted units were on standing or walking horses, so it was a change to paint up these much more animated figures, and I was very pleased with the result. This regiment was owned by the powerful Condé family, and so its musicians wore the family’s colours instead of the regular French royal livery. A picture of the mounted drummer in the Osprey book Louis XV’s Cavalry shows the yellow-buff and red Condé livery, with which I have painted the trumpeter in my unit. Observant readers might have noticed that some of the swords are longer than others – this is because apparently these figures were a mix of older and newer Front Rank castings. For the flag, the only information I had at that time was a written description, which I had to use my imagination to interpret in Corel Paint. The cross-hatched design on the yellow-buff side of the flag is a symbolic funeral pyre. As it turned out, I wasn’t too far off in my interpretation of the Condé flag. After I had done my flag, I came across a 1771 print which showed the flags of the French infantry and cavalry regiments. You can see the funeral pyre on the Condé flag quite clearly. The original print has faded considerably, so the yellow-buff colour has changed to white. 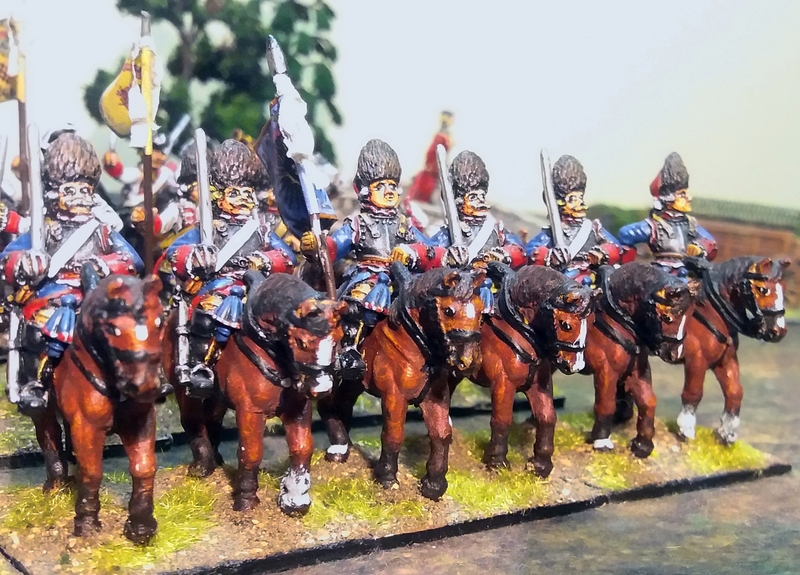 So that’s my French cavalry. Next time we’ll look at the artillery. And don’t forget to visit my other On Parade! 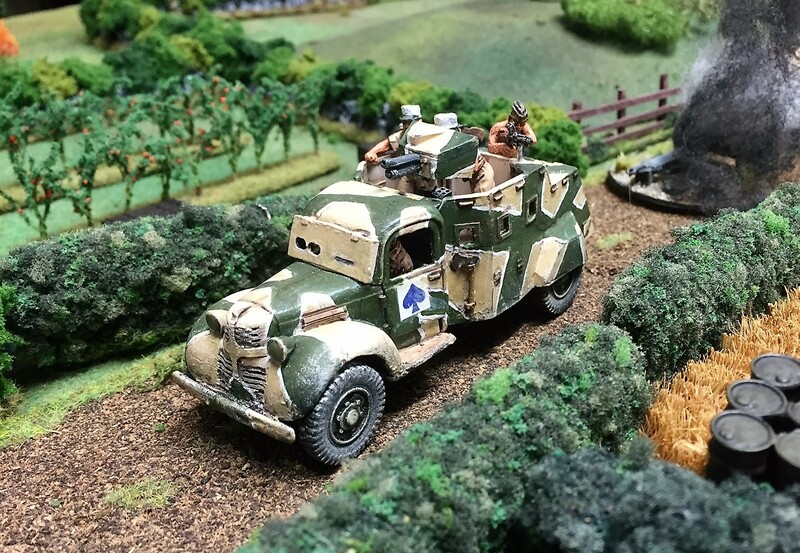 postings, in which I’m gradually doing inspection parades of every army in my wargaming collection. 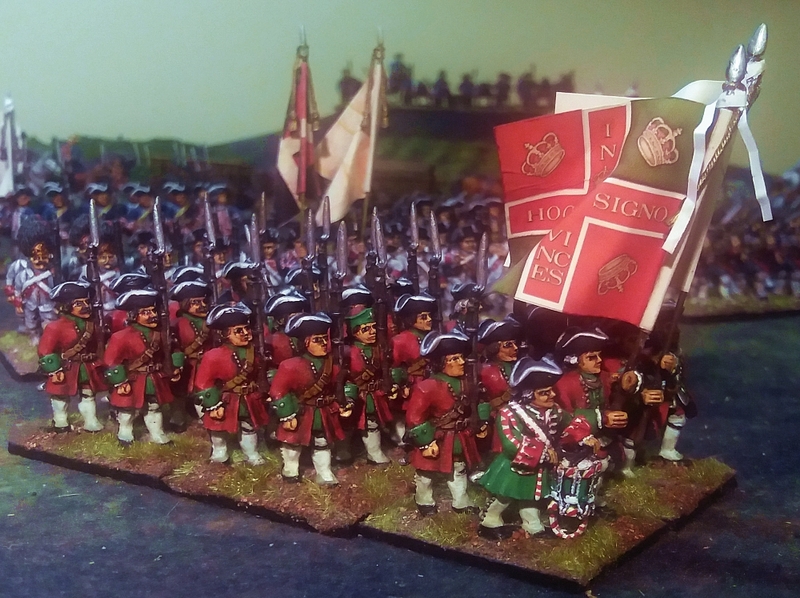 Continuing in our inspection parade of my eighteenth-century French army, we now come to the light troops. After a period of preoccupation with massed fire, light troops were gradually being re-incorporated into armies during this period. Marshal Saxe considered the aimed fire of light troops as being the only effective fire. There were always parts of the battlefield, woods, copses, hedges and buildings where they could be used to good effect. 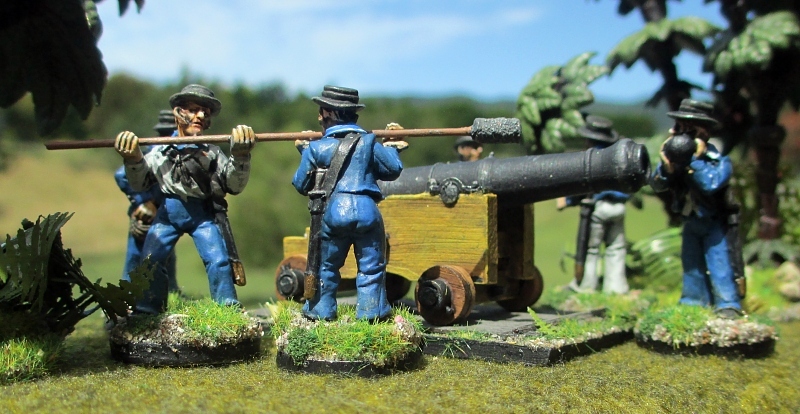 So of course my miniature French army had to have at least a couple of these pioneering units. The Chasseurs de Fischer were established in 1743 by a former officer’s valet who made a reputation for himself guiding other valets in and out of the islands of the Moldau River to pasture the officers’ horses. The unusual cap worn by these troops is called a mirleton, more commonly worn by hussars than infantry during this period. The officer wears a fur trimmed jacket. This is how he is modelled by Front Rank, but I believe the fur trim was worn by another light troop unit, the Arquebusiers de Grassin, not the Chasseurs de Fischer, so my officer might not be strictly accurate. These light troops wear an odd type of helmet, called a ‘schomberg’. This makes quite an interesting change from the tricornes mainly worn by soldiers of this period. According to my references, the Clermont-Prince’s coats were coloured ‘ventre de biche’. A request to French-speakers revealed this to translate as “doe’s belly”. I was told this colour was a kind of light pinkish white, so that is what I used to painted my troops’ coats. However, I found out later that pinkish-white is incorrect – it should be a shade of ochre. Let’s say that their coats are very faded! I particularly like Front Rank’s officer figure, with his voluminous frock-coat contrasting with his strange helmet, and wielding his sharp-looking sword. That brings us to the end of my French infantry. My next posting will cover the cavalry. And don’t forget to visit my other On Parade! 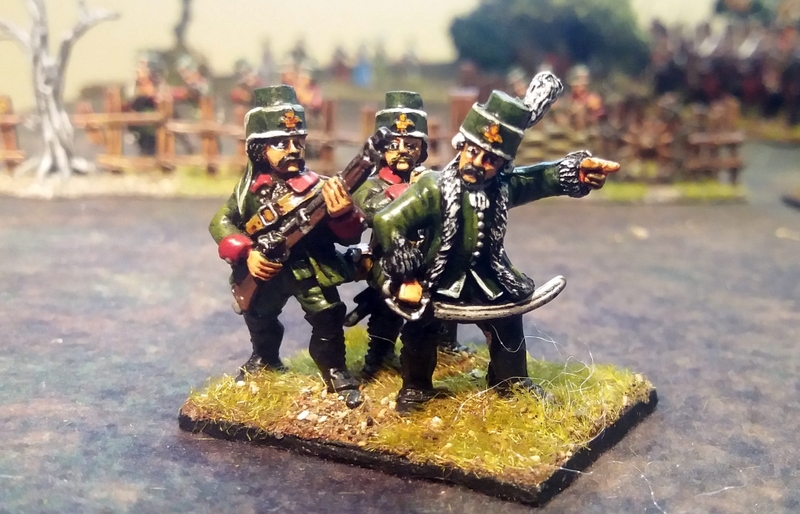 postings, in which I’m gradually doing inspection parades of every army in my wargaming collection. Having previous inspected the French and foreign infantry in my eighteenth century French army, we now come to the guards and grenadiers. 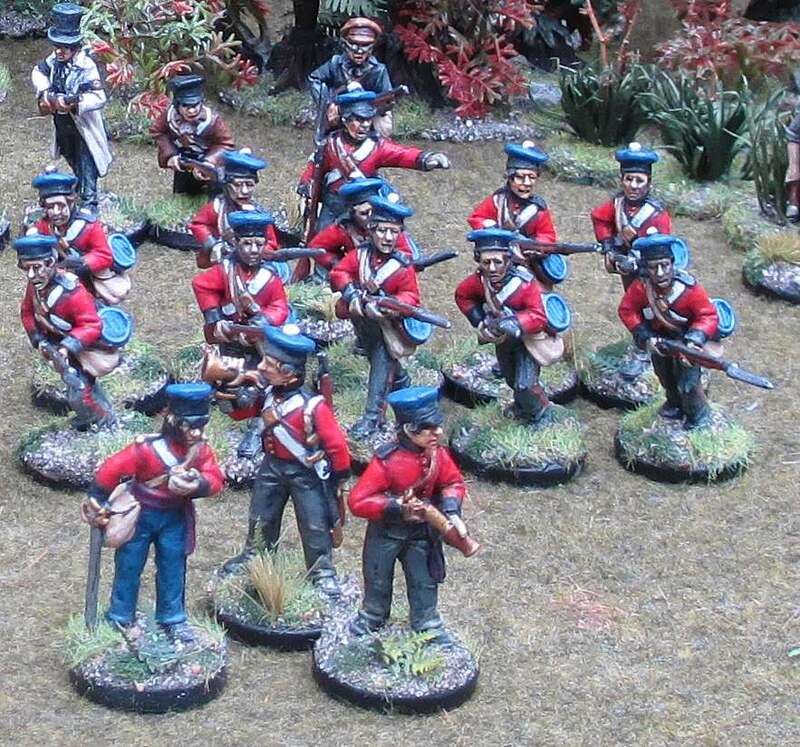 These Gardes Françaises were the first Front Rank figurines that I ever painted. I still recall how surprised I was at how easy the job was made by the fine sculpting of the models. The Gardes Françaises were part of the King’s Royal Household. Their uniform was quite ornate, compared to normal infantry uniforms. For instance, the belt slung over the soldiers’ left shoulders was lined with lace. 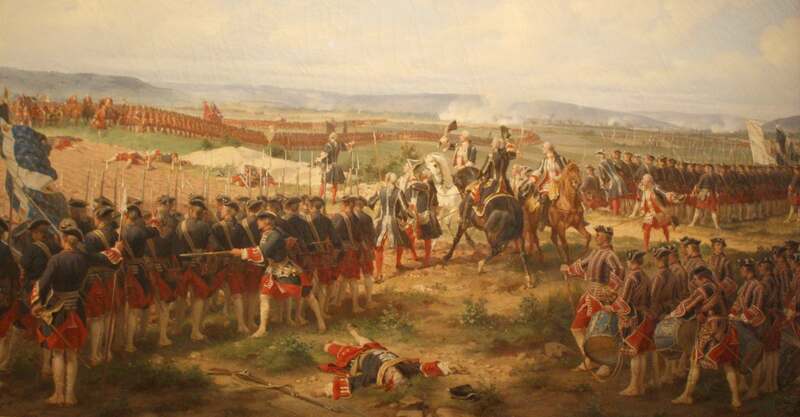 I have always admired Phillipotteaux’s famous painting of the Gardes Françaises at the Battle of Fontenoy (see my more detailed posting about this painting), so I determined to paint my soldiers as shown in Phillipotteaux’s work, rather than from other sources which differ somewhat. 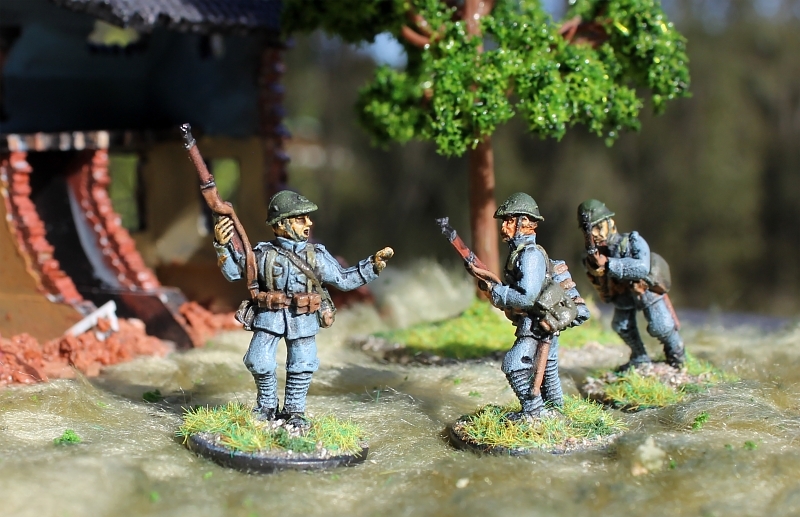 The flags for my minature regiment are by GMB Designs. I added white cravattes made from paper. All French regiments had these tied to the top of their flag staffs. Note also that I painted the officers with red stockings rather than white gaiters (as shown in the Phillipotteaux painting). My Gardes Françaises regiment can also change identity if required! 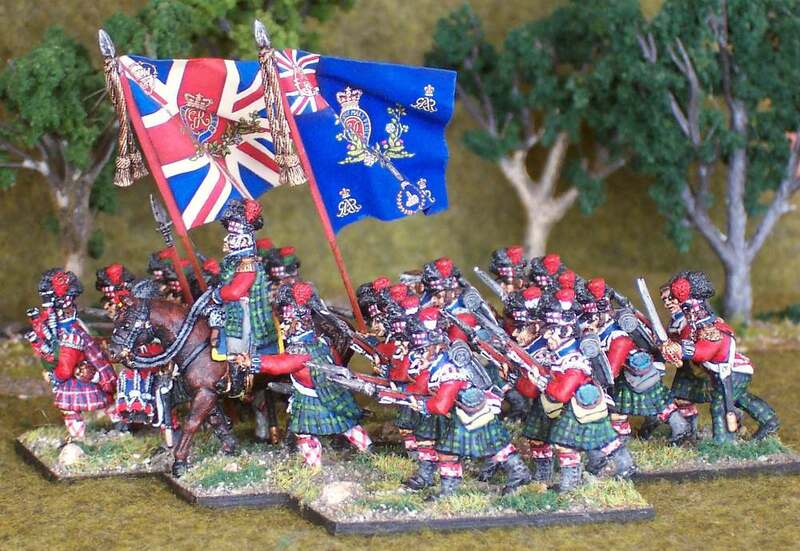 If there is no call for guards in a game, then I can easily change the flags to those of the Ecossais Royal (Royal Scots). The uniforms of these two units were vaguely similar, so they can pass as one another near enough. “As fierce and terrible fellows as I ever saw”, remarked a British eye-witness about the Grenadiers de France at the Battle of Minden in 1759. The four brigades of Grenadiers de France were composed of the former elite companies from several disbanded regiments. Their blue and red uniforms with the black bearskin hats give them an imposing appearance. 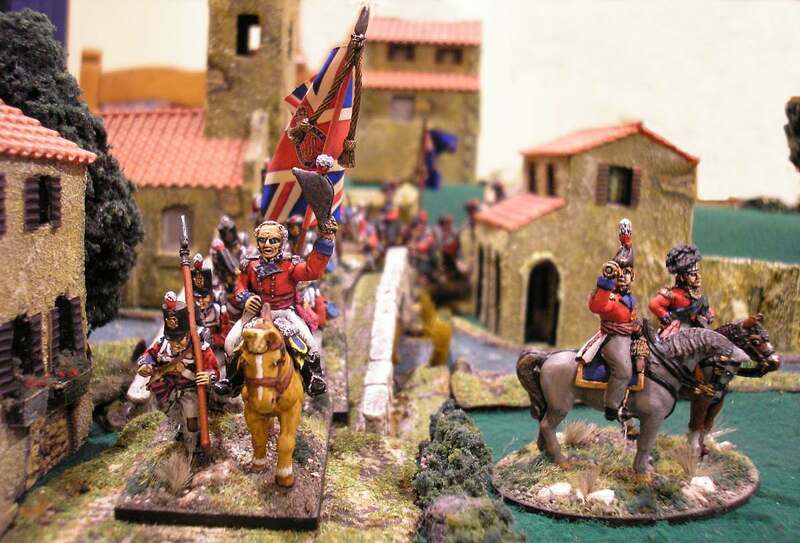 In the early 2000s I obtained quite a few miscellaneous Front Rank grenadier figures in a bulk second-hand deal, so it was only natural to paint them up as this very distinctive unit. My next posting will cover the light infantry. And don’t forget to visit my other On Parade! 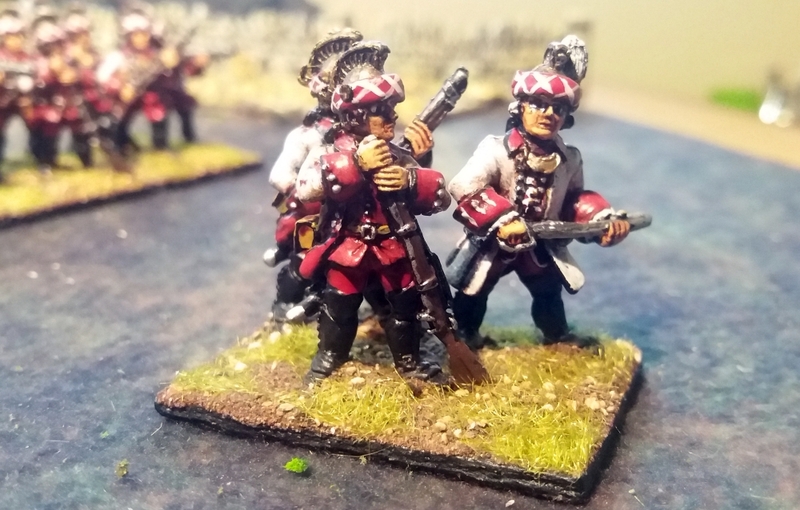 postings, in which I’m gradually doing inspection parades of every army in my wargaming collection. The French army included quite a few foreign troops, amongst them Swiss, Germans, Swedes, Scots, Italians, Netherlanders, and, of course, the famous Irish ‘Wild Geese’. 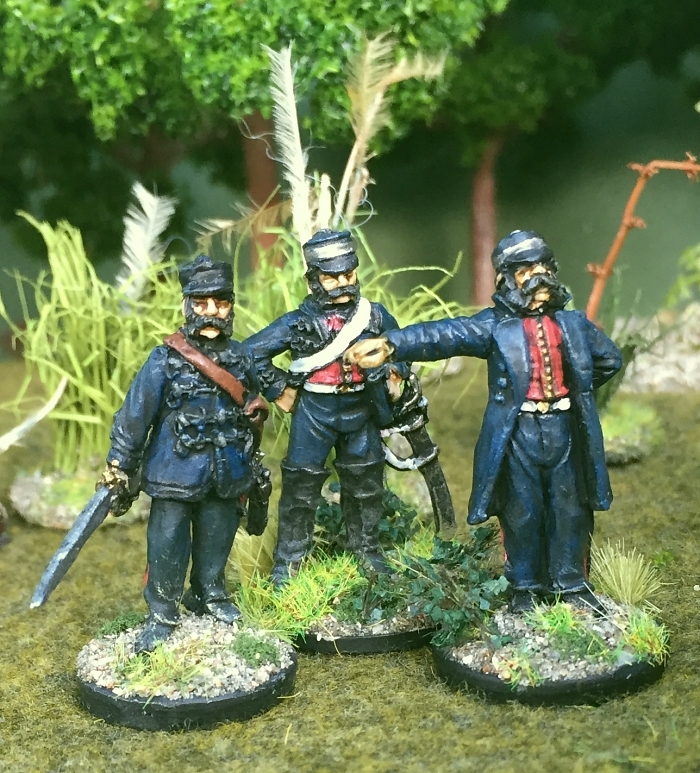 I wanted to portray one of the Irish red-coat ‘Wild Geese’ regiments in my army, and so chose the Regiment Lally, which was renowned for its service in India. I liked the combination of red with green cuffs. I had never really used the black undercoat method of painting before, but found it worked very effectively. 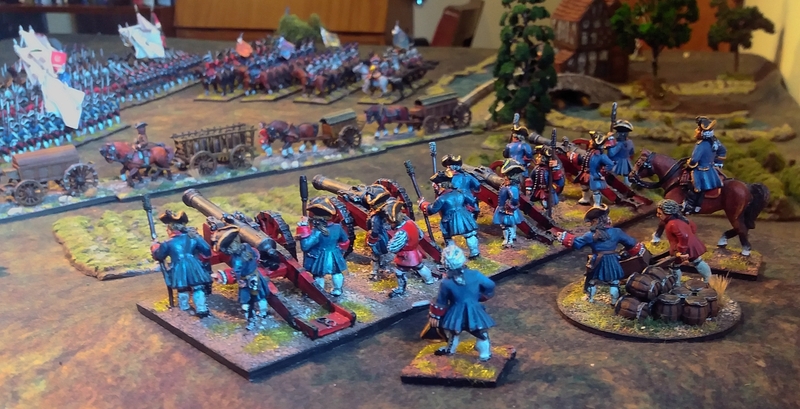 The red coats were quite difficult to do, however, as the red paint remained quite dull over the black undercoat. The flags are by GMB Designs flags. If I recall correctly, I reversed the colours of the quadrants in GMB’s version of the flag, which I felt were wrong. But we’re not so young at our trade. We’re fighting for France again! Head to the storm as they faced it before! And when there’s no fighting, it’s Ireland no more! The English – left at Ghent. As all of Ireland knows! For where there are Irish there’s memory undying. And when we forget, it is Ireland no more! Than water under the bridge. Like salmon to the sea. Old Days! The wild geese are ranging. And when they are changed, it is Ireland no more! When Louis was our King. When life was made splendid with gifts and rewards? In the hour of your agony, Mother of Swords? And when we stop either, it’s Ireland no more! In 1995 Belgium and Ireland put out a joint stamp commemorating 250 years since the Battle of Fontenoy in 1745. The Irish Brigade, including the Regiment Lally, suffered many casualties in the battle at the Bois de Barry (or Barry Wood, as Kipling calls it in the poem above). The stamps depict the memorial to the Irish Brigade in the village of Fontenoy, and also two Irish soldiers (though neither, unfortunately, are members of the Regiment Lally). The Regiment la Marck was one of the German regiments in French service, and was initially raised in 1682. King Louis paid them and furnished them with clothing, arms and ammunition. German regiments generally wore lightish-blue coats, but were otherwise armed and equipped as French infantry. 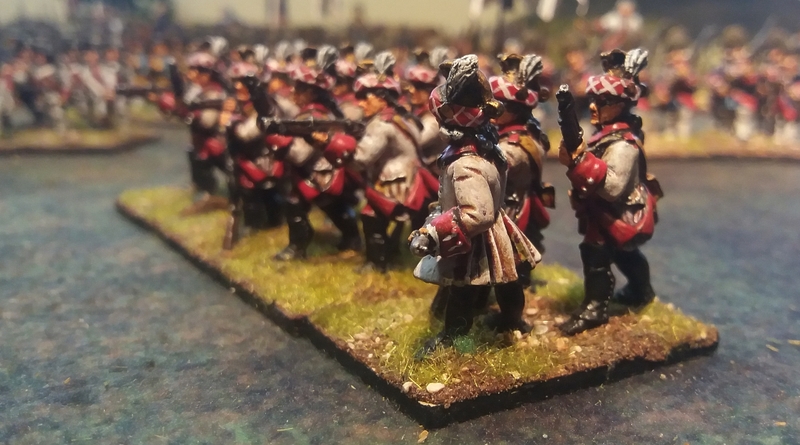 My source for painting these figures was the illustration in John Mollo’s Uniforms of the Seven Years War 1756-63. I especially liked the combination of yellow and light-blue, which makes a nice contrast against the other colours in my army so far. The drummer is wearing a white coat with black and white chequered lace. 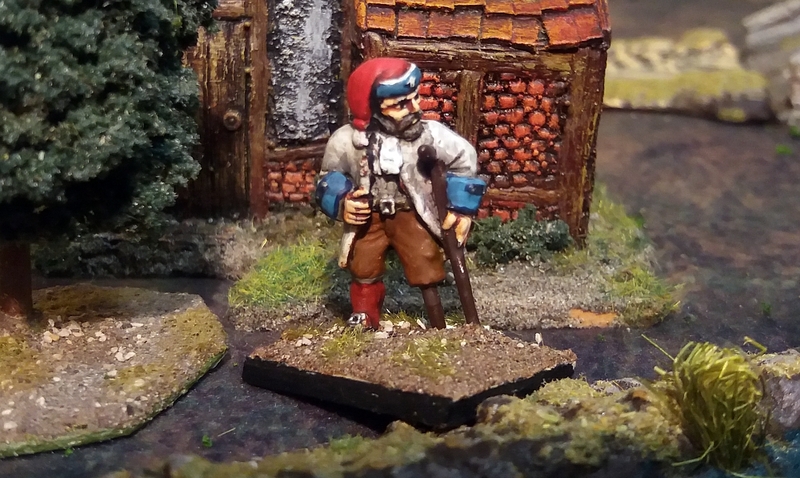 In the back rank you’ll notice that Grenadier Hans Gruber is building up some Dutch courage just before the battle! My next posting will cover the guards. And don’t forget to visit my other On Parade! 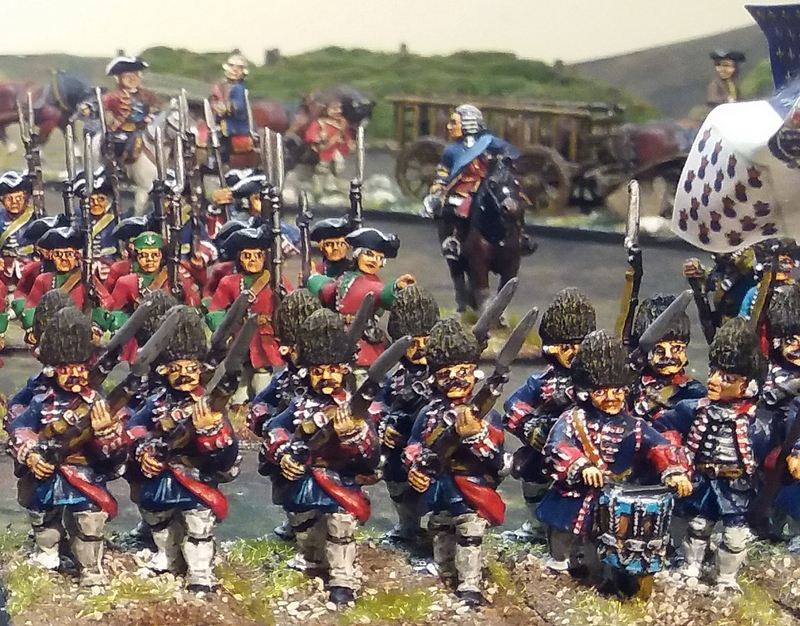 postings, in which I’m gradually doing inspection parades of every army in my wargaming collection.